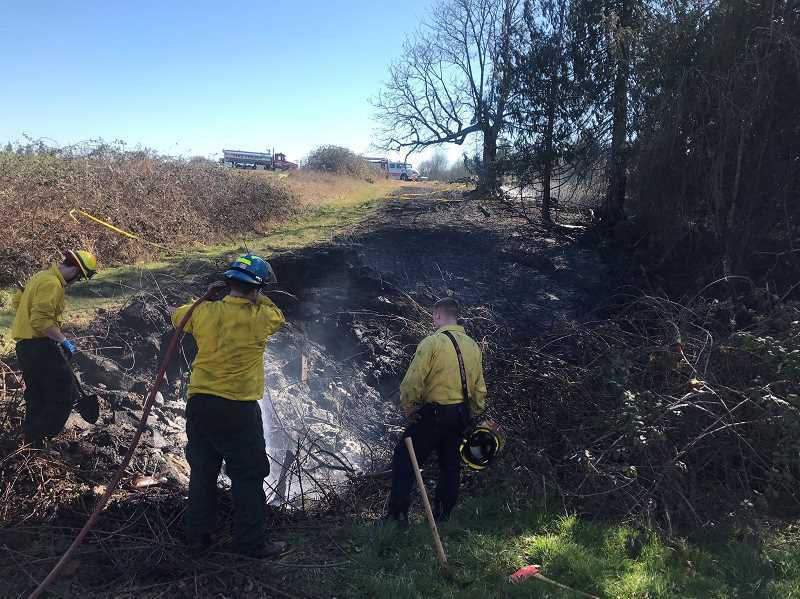 Marion County and Clackamas County fire defense boards conjointly announced a burn ban Wednesday, March 20, effective immediately. The burn ban is in effect for Marion, Clackamas and Linn counties and will remain in effect until further notice. The ban includes agriculture burning, back yard burning, camp fires, fire pits, and yard debris. The ban comes in the wake of a number of recent wildfires in Marion, Linn and Clackamas counties, including the Santiam Park Fire near Lyons, which was reported Tuesday. Winds push that fire to jump the North Santiam River and spread to roughly 60 acres as crews from Lyons, Sublimity, Mill City and the Oregon Department of Forestry and other agencies battled it. The American Red Cross set up an evacuation shelter at an elementary school in Lyons. By Tuesday evening, evacuations had been issued to several nearby areas as an estimated 35 homes and 30 outbuildings were considered threatened. The fire was 80 percent contained by late Wednesday afternoon, mapping out at 189 acres, and the evacuations were lifted. "Some folks seem surprised to see this fire on the landscape in March," said Incident Commander Blake Ellis, "but as firefighters, we are trained to consider the conditions, not the calendar." No injuries or property loss has been reported. Meanwhile, Aurora Fired District Lt. Bill Hansen noted that over the past few days AFD and neighboring fire districts have kept busy responding to multiple escaped burns that cause brush fires, exacerbated by east winds and unseasonably warm temperatures. AFD requests that burn-ban violations be reported to (503) 678-5966. For more wildfire prevention information and restrictions, visit the Office of the State Fire Marshal, keeporegongreen.org and the Oregon Department of Forestry.